1. Reads motors encoders and provides counts in registers for determining distance traveled and direction . 2. Drives two motors with independent or combined control. 3. Motor current is readable through registers. 4. Only 12v is required to power the module. 6. 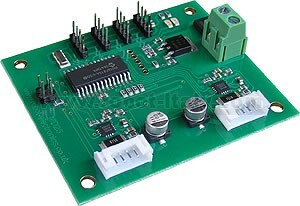 Steering feature, motors can be commanded to turn by I2C register value. When using our EMG30 encoded motors, you will find that a 10n noise suppression capacitor has already been fitted. Other motors may require suppression. This is easily achieved by the addition of a 10n snubbing capacitor across the motors. The capacitor should also be capable of handling a voltage of twice the drive voltage to the motor. The Red Power Led indicates power is applied to the module. A Green Led initially flashes the I2C address and then lights for 500mS to indicate correct I2C activity to the module. The internal 500mS timer is restarted each time there is I2C activity, so it will be on during continuous access. By using feedback from the encoders the MD25 is able to dynamically increase power as required. If the required speed is not being achieved, the MD25 will increase power to the motors until it reaches the desired rate or the motors reach there maximum output. Speed regulation can be turned off in the command register. The MD25 is designed to operate in a standard I2C bus system on addresses from 0xB0 to 0xBE (last bit of address is read/write bit, so even numbers only), with its default address being 0xB0. This is easily changed by removing the Address Jumper or in the software see Changing the I2C Bus Address. 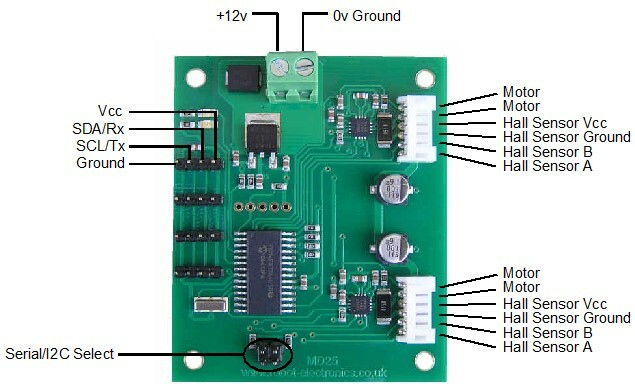 I2C mode allows the MD25 to be connected to popular controllers such as the PICAXE, OOPic and BS2p, and a wide range of micro-controllers like PIC's, AVR's, 8051's etc. Depending on what mode you are in, this register can affect the speed of one motor or both motors. If you are in mode 0 or 1 it will set the speed and direction of motor 1. The larger the number written to this register, the more power is applied to the motor. A mode of 2 or 3 will control the speed and direction of both motors (subject to effect of turn register). When in mode 0 or 1 this register operates the speed and direction of motor 2. When in mode 2 or 3 Speed2 becomes a Turn register, and any value in this register is combined with the contents of Speed1 to steer the device (see below). Turn mode looks at the speed register to decide if the direction is forward or reverse. Then it applies a subtraction or addition of the turn value on either motor. If the either motor is not able to achieve the required speed for the turn (beyond the maximum output), then the other motor is automatically changed by the program to meet the required difference. Each motor has its encoder count stored in an array of four bytes, together the bytes form a signed 32 bit number, the encoder count is captured on a read of the highest byte (registers 2, 6) and the subsequent lower bytes will be held until another read of the highest byte takes place. The count is stored with the highest byte in the lowest numbered register. The registers can be zeroed at any time by writing 32 (0x20) to the command register. A reading of the voltage of the connected battery is available in this register. It reads as 10 times the voltage (121 for 12.1v). A guide reading of the average current through the motor is available in this register. It reads approx ten times the number of Amps (25 at 2.5A). If you require a controlled acceleration period for the attached motors to reach there ultimate speed, the MD25 has a register to provide this. It works by using a value into the acceleration register and incrementing the power by that value. Changing between the current speed of the motors and the new speed (from speed 1 and 2 registers). So if the motors were traveling at full speed in the forward direction (255) and were instructed to move at full speed in reverse (0), there would be 255 steps with an acceleration register value of 1, but 128 for a value of 2. The default acceleration value is 5, meaning the speed is changed from full forward to full reverse in 1.25 seconds. The register will accept values of 1 up to 10 which equates to a period of only 0.65 seconds to travel from full speed in one direction to full speed in the opposite direction. 0, (Default Setting) If a value of 0 is written to the mode register then the meaning of the speed registers is literal speeds in the range of 0 (Full Reverse) 128 (Stop) 255 (Full Forward). 1, Mode 1 is similar to Mode 0, except that the speed registers are interpreted as signed values. The meaning of the speed registers is literal speeds in the range of -128 (Full Reverse) 0 (Stop) 127 (Full Forward). The I2C address can be changed by writing a new address to the MD25, or by fitting/removing the Address Jumper. 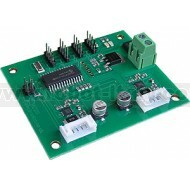 To change the I2C address of the MD25 by writing a new address you must have only one module on the bus. Write the 3 sequence commands in the correct order followed by the address. 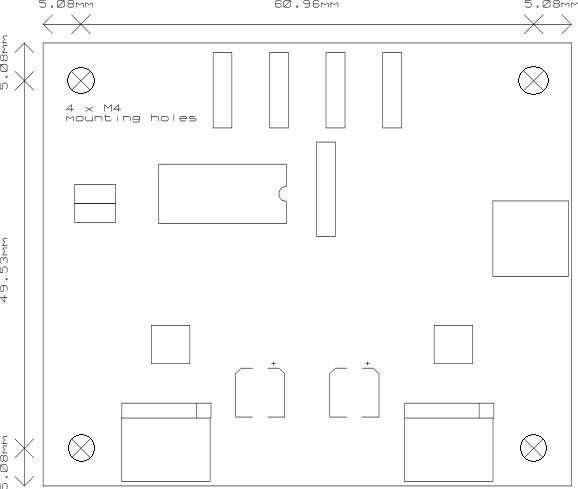 Example; to change the address of an MD25 currently at 0xB0 (the default shipped address) to 0xB4, write the following to address 0xB0; (0xA0, 0xAA, 0xA5, 0xB4 ). These commands must be sent in the correct sequence to change the I2C address, additionally, no other command may be issued in the middle of the sequence. The sequence must be sent to the command register at location 16, which means 4 separate write transactions on the I2C bus. Because of the way the MD25 works internally, there MUST be a delay of at least 5mS between the writing of each of these 4 transactions. When done, you should label the MD25 with its address, however if you do forget, just power it up without sending any commands. The MD25 will flash its address out on the green communication LED. One long flash followed by a number of shorter flashes indicating its address. Any command sent to the MD25 during this period will still be received and writing new speeds or a write to the command register will terminate the flashing. Take care not to set more than one MD25 to the same address, there will be a bus collision and very unpredictable results. The I2C address can also be changed by fitting/removing the Address Jumper. With the jumper in place (factory default) the address is the same as programmed into the module (factory default is 0xB0). Removing the jumper will change the address to the next one up. The default address of 0xB0 will change to 0xB2 if the jumper is removed. 0xBA would change to 0xBC. The exception is 0xBE, the jumper has no effect on this address. After fitting or removing the Address Jumper, the MD25's I2C address will not change until the next time the module is powered on.